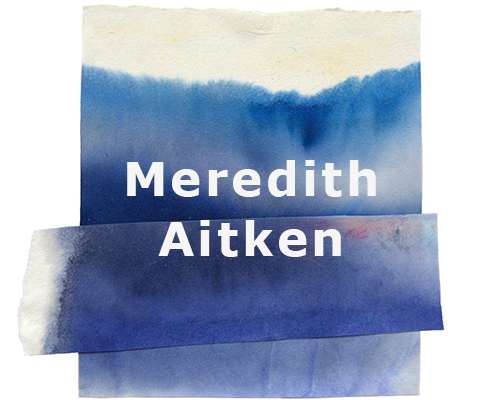 Meredith Aitken works in acrylics and mixed media, combining painting, collage and printmaking techniques. She has also recently been working in oils on a a new project, Interiors and Exteriors. Meredith lives in Vancouver and her work has been exhibited in the United States and Canada. 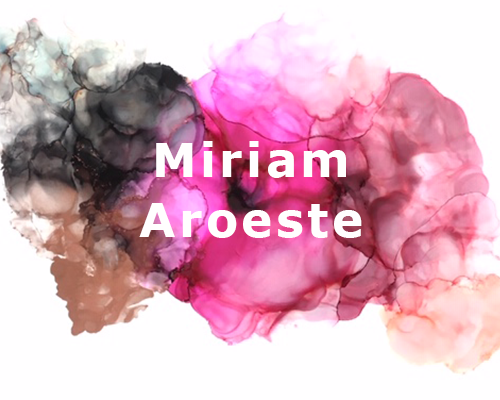 Born in Mexico City and based in Vancouver, Miriam Aroeste has been working in visual arts as a Curator, Art Consultant and Professional Artist for over 20 years. Her wild curiosity and natural sense of adventure got her to travel study and live in many different counties. Always attracted to Art she studied Cinematography in Rome, Italy where she met Fellini, Antonioni, and studied under Ettore Scuola. Aroeste holds a Fine Art degree from Emily Carr University of Art and Design. The meditative quality of Aroeste’s work goes beyond any specific association, her abstract compositions invite to create a spiritual plane for the viewer to reflect and she hopes to achieve an emotional response, which is not conceptual, but something felt on a more instinctive level. Her work is intended to be viewed as one would listen to instrumental music, without feeling a need to attach a meaning or narrative. Miriam has exhibited in Canada, USA, France and Mexico and her work is collected locally and internationally. 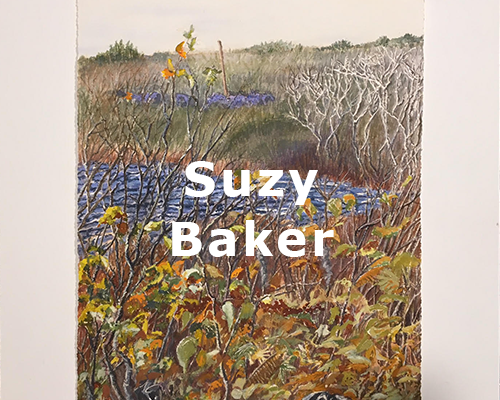 Suzy Baker is a Vancouver born artist whose passion for art-making began early. It evolved through textile design, an award winning career in architecture and a ten year atelier in Istanbul. In Turkey Suzy started making mash-up textile creations that she sold at her Atelier Istanbul on Granville Island. In 2013 she moved her well travelled mixed-media entourage to her studio on the 4th floor of 1000 Parker. Here you find her wearable art as well as her continuation of fine crafted fine art work, albeit at a smaller scale than her murals such as at Heritage Hall and for the BC and German Pavilions at Expo 86. For the 2017 Parker Art Salon, the featured botanical works were executed on trips to Mexico, her small ink drawings are from Ireland. Deborah is a painter with a Post Modern approach to her abstraction. Her current work with oil and cold wax embraces the temporal. It references architectural and mechanical structures in her gritty, urban environment and it relies on the viewer to construct meaning. Following a Bachelor of Education (English/Fine Arts) from Simon Fraser University and her 12 year career as a Humanities educator, Deborah earned a Certificate of Fine Art from Emily Carr University in 2007 and travelled extensively for 3 years. She had her first exhibitions while living for 2 years in Istanbul where she also began her career as a full time painter. 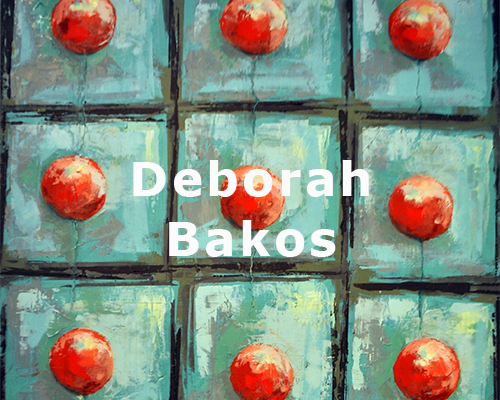 Deborah currently exhibits her work locally, nationally and on line and she contributes annually to charitable causes related to youth, health, public art and the environment. Elizabeth Barnes is a dual US / Canadian artist and has lived and worked in Vancouver for the past 12 years. 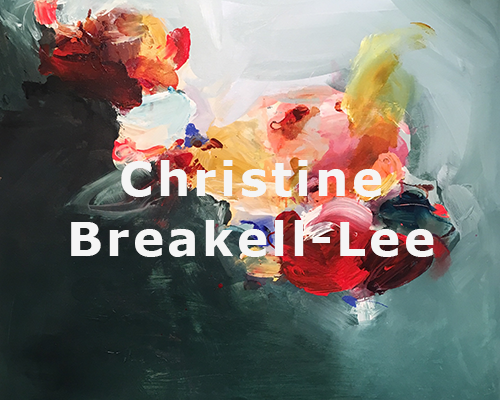 She received her BFA in painting from Tyler School of Art in Philadelphia and her MFA in studio practices from the University of North Carolina. 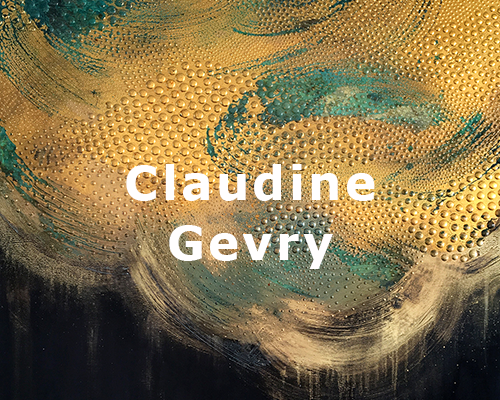 Her work has been exhibited across the United States and Canada and is held in both private and public collections in North America and in Europe. Emily Carr Institute of Art and Design Alumnus and Board Member Judson Beaumont is known for his engaging, whimsical and often surreal approach to furniture, design and public installations. His intrinsic passion and respect for good design, materials, and exceptional craftsmanship has brought him a worldwide reputation. As a child, Suzy studied dance while absorbing Hollywood musicals, film noire and the mysteries of Rembrandt. As an adult, she's been seduced by the sensuous spontaneity of Clay, Colour and the essence of Romance. Suzy's imagery is a marriage of her childhood and adult influences. The figure dominates her work. She is compelled to create archetypal icons embracing the power of Ancient and contemporary World cultures, overlaid with the spirit of song and dance. 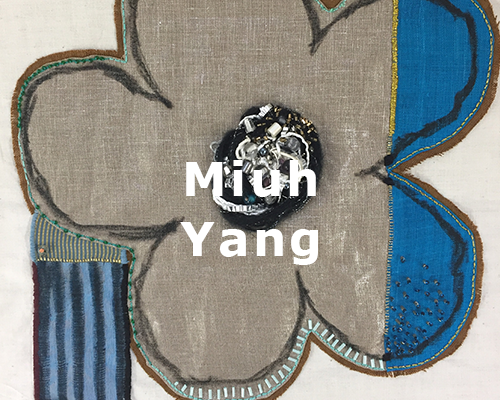 Her work celebrates our interconnectedness and individuality. Each stage of Suzy's work has a natural progression. The paintings on pottery are inspired by her sculptures; the sculptures often carry her vessels. Suzy explores the scale and diversity of her vision by creating miniature to life size figures accompanied by luminous oil paintings referencing these sculptures. Kyla Bourgh is an artist, writer/publisher and events organizer living in Vancouver. 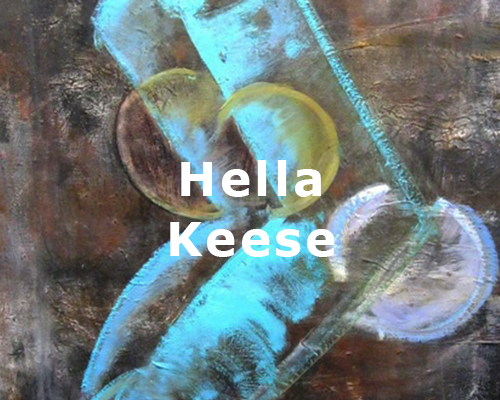 Her work, whether abstract or representational, is based on using a stream of consciousness practice to connect with the immediate and authentic. Her imagery is sourced from a combination of collage and images from inside her brain. Her abstracts are visual poems based on emotional excavation and examination. My mixed media art includes various components: oil and acrylic paint, fine art papers, cold wax, resin, pouring medium, encaustic medium, oil sticks, pastels, watercolour and water colour inks, pigments and pigment sticks alcohol based inks, plaster and modeling paste, digital composites as well as photographic and text overlays. I paint on wood panel, mulberry and rice paper, canvas, metal and plexiglass. I have studied painting at Emily Carr and photography at Langara College and have approx. 3500 hours of training. In addition i have developed my own techniques in the area of digital compositing, digital silkscreen and linocut techniques. robots and mixed media pieces layered with resin. 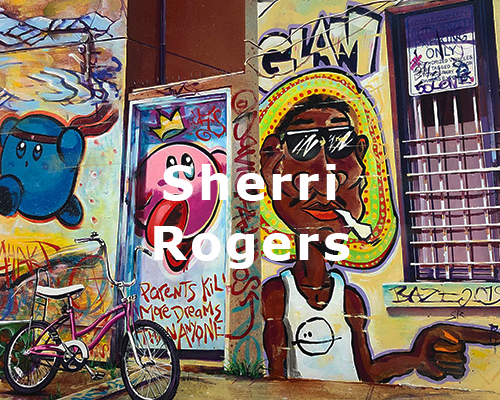 A lifelong learner, Kris transitioned from photography and graphic design to becoming a full time painter after studying at Emily Carr University. She developed a strong online following and has shipped work to collectors across the globe. A contemporary jewellery artist, Lydia Buxton pairs alternative materials with traditional aspects of metal smithing. Her pieces explore the mechanics of memory, both defined and distant that link each of us to our earliest experiences in natural spaces. Recalling shifts of sensory cues her mix of soft and bold palettes are contrasted by darkened silver. Tucking unusual materials between repeating elements, pieces are green, warm, grey and cloudy – a collection of tactile reminders that bring the garden past into the daily present. Recently relocated from Halifax, she earned a BFA in majoring in jewellery design and metalsmithing at NSCAD University (2013). Today she lives and works in East Vancouver. Her work is represented by Charon Kransen Gallery in New York, NY and by L.A. Pai Gallery in Ottawa, ON. 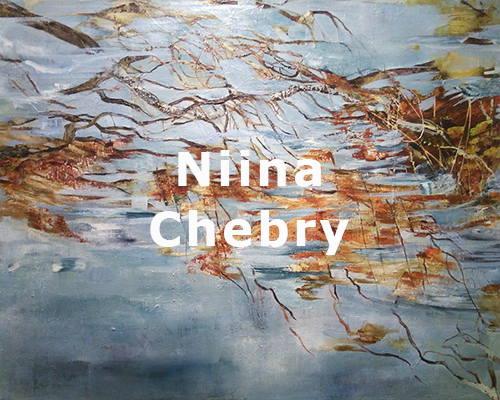 From a land of vast prairie skies of rural Alberta, artist Niina Chebry now lives in Vancouver, where the shift to coastal flora and fauna seep into her compositions. Wandering comfortably between worlds of the abstract and the narrative – nuances from time spent in Asia, Europe and South America filter into her work. Niina’s paintings are included in public and private collections in Canada, United States, Europe and Japan, notably in exhibitions at the Canadian Embassy and the Ueno Royal Museum of Art. 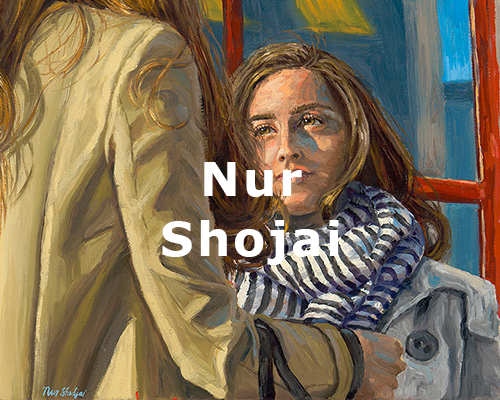 Niina is represented by Vancouver Art Gallery Art Rental. Donna Cowan is a Vancouver-based visual artist specializing in painting. She was born in Kingston, Ontario. She studied at York University in Toronto, and earned a BFA at Nova Scotia College of Art and Design in Halifax. She worked in the commercial classical animation industry for ten years on feature films, television specials, and commercials. 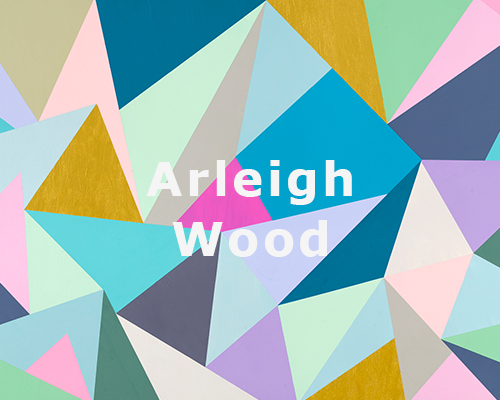 Her freelance experience includes illustration, portraiture, mural, faux-finish and decorative paint experience. She has lived in East Vancouver for over twenty years, where she raised two children. 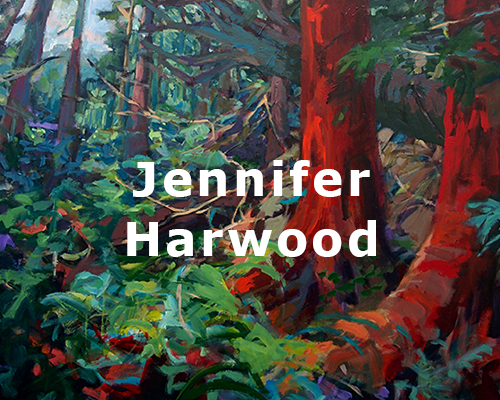 Her self-directed works have been largely focused on the coastal landscape of British Columbia. For de la Cajiga art is a balance between reality and imagination. She calls herself an illusionist and an interpreter. She does not follow trends, her interest is the transformation of reality to create artwork that shows the tension between intellect and intuition, enjoyment and surprise. She is now working in the series, ‘City in Flux - Work in Progress’, which focuses on the hasty changes our cities are going through. Each artwork is composed of multiple photographs, sometimes as many as 50, stitched together, then altered and digitally painted to create new landscapes. The creation process involves architecture, engineering, city planning and lots of imagination. 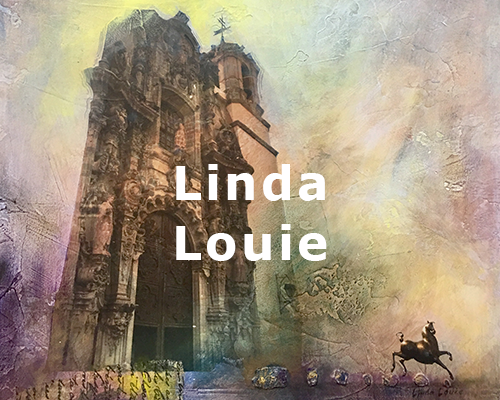 Her art education is eclectic and continual, it started at the Louvre Museum, in Paris, followed by Langara, Capilano, Emily Carr, in Canada, the Art Institute in San Miguel Allende, Mexico, and the Academy of Realist Art in Seattle. De la Cajiga has exhibited in Canada, Mexico, the U.S., and Venezuela. Her work is part of the West Vancouver Museum, the Business Council of BC, and the Richmond Hospital collections; and is in private collections in Australia, Brazil, Canada, Chile, France, Mexico, Spain, the U.S., and Venezuela. 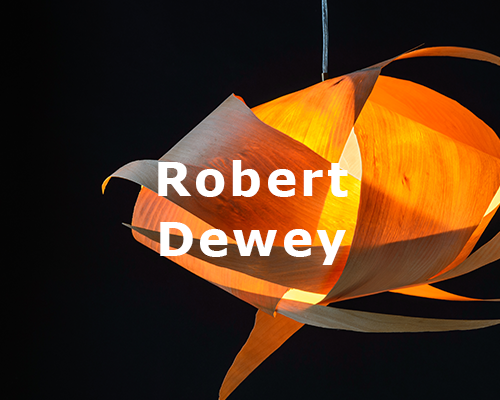 Born in Montreal, went to film school in Toronto, and a long-time citizen of Vancouver, Robert Dewey's multifaceted creative career spans design, film, video, performance arts, and digital media. A life-long woodworker, Robert learned his craft at the side of his father and grandfather. Using time-honoured handcrafting techniques, combined with a modern design aesthetic, Robert creates 3-dimensional lighting designs that showcase the beauty of its materials, ranging from wood veneers to paper and plastics. He also draws inspiration from his other creative pursuits, including leading the software marketing agency Hotfusion and strategic guidance for the non-profit society Theatre Conspiracy that will be taking its work to the 2017 Edinburgh Fringe as part of Canada Council showcase. Marney-Rose was raised in New Zealand in the beautiful art deco seaside town of Napier. Born into a creative family; her dad was an avid amateur photographer, and her mum hand coloured photographs and dabbled in pastels. Ever since being a child, Marney-Rose has loved creating beautiful things; always fascinated with colour. She is a late bloomer venturing into painting in her forties but has an inexhaustible passion for it. A natural teacher, Marney-Rose has a following with her watercolour classes and workshops. She teaches privately and for various Art Associations. 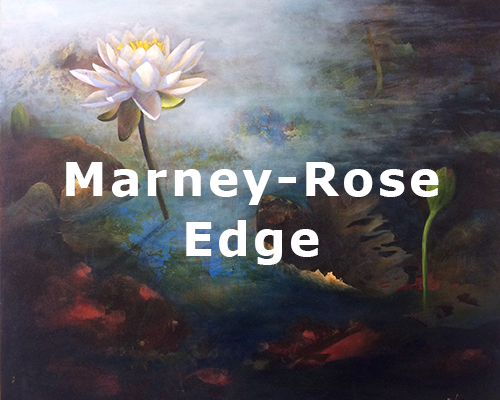 After a career spanning almost 30 years in the Graphic Arts/Printing industry, an opportunity for Marney-Rose to become an entrepreneur/sole business owner, presented itself so she could paint full-time. Marney-Rose paints realistically, influenced by romantic beauty and an ethereal softness creating for you an escape from the everyday. 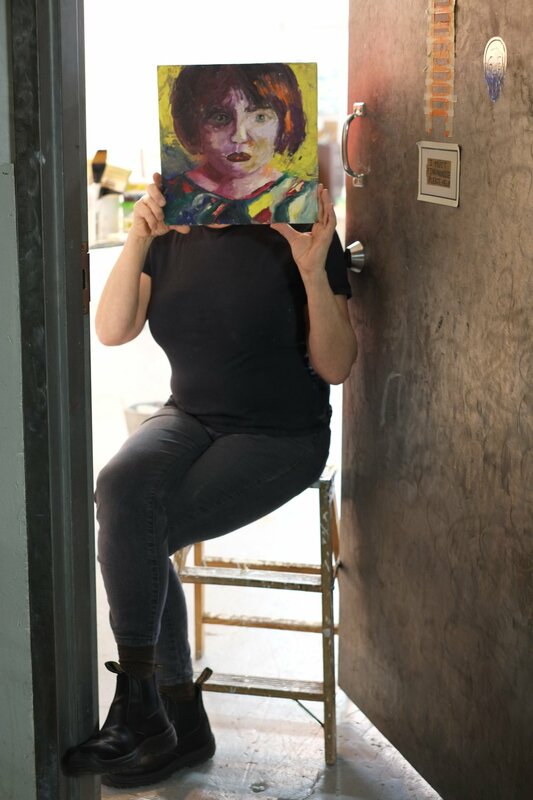 Melanie Ellery is a visual artist creating bold, colourful, abstract paintings in her Parker Street studio. 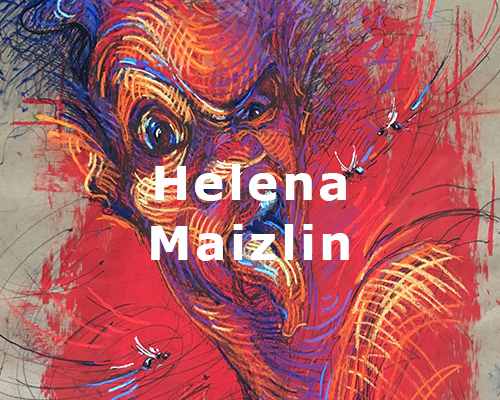 Melanie views her work as a journey of experimentation, learning, discovery and fulfillment. Painting can be rewarding, sometimes tortuous and it’s this that drives her forward. Her inspiration comes from both nature and the chaos of our modern lives and her work exudes more of feeling of this, than being representational. Melanie’s paintings are process-driven, intuitive and spontaneous–allowing the work to go where it may, then stepping in to control its resolution–a duality that forms something complete. She employs vibrant colours, shape and pattern. Layers of paint are applied, reapplied, and then often removed, revealing what was once there. Melanie aspires to create art that evokes a sense of joy. Melanie is excited to participate in an artist residency this Fall in Sicily with a group of Canadian women. Denna Erickson Denna was born in Edmonton, Alberta. She studied at Emily Carr Institute of Art & Design, earning a Bachelor of Fine Arts degree and has also attained a Bachelor of Education degree from the University of Victoria in 1997. She has been teaching and working as an artist in the city of Vancouver for the past 10 years. Denna specialized in using oil on wood & plaster. She often combines encaustic and transfer techniques with her work. Her paintings consist of personal symbols and organic shapes layered in glazes of luminscent color. Shapes and forms are transcended through transparent layers of paint. Lynn is a figurative sculptor working mostly in bronze. She has lived and studied art and languages in Montreal, France and Mexico. She currently lives in Vancouver, and works from her studio at 1000 Parker Street. Lynn’s work is shown at West Vancouver’s Buckland Southerst Gallery, Gild & Co, and several other Lower Mainland locations which are listed at PhysicalAttachments.com. Lynn has worked as a sculptor and shown her work publicly for over ten years. Prior to that, she had a career in Graphic Design and Photography. She is a member of the Sculptors Society of BC, and has participated in several group and solo shows over the past ten years. 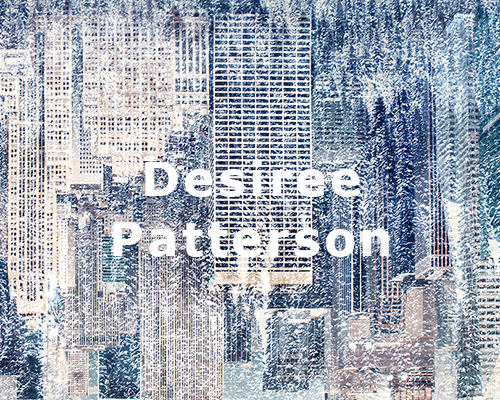 Her work has been included in the Arts Umbrella ‘Splash’ Auction, and she is a regular participant in the EastSide Culture Crawl, Kate Duncan’s Address and the Annual Parker Art Salon. Michael Fitzsimmons graduated from Emily Carr College of Art. He works with catalyzed lacquers creating artworks that are quite process oriented, but he strives to represent something abstract in hope that the viewers will look beyond the surfaces of the paintings. 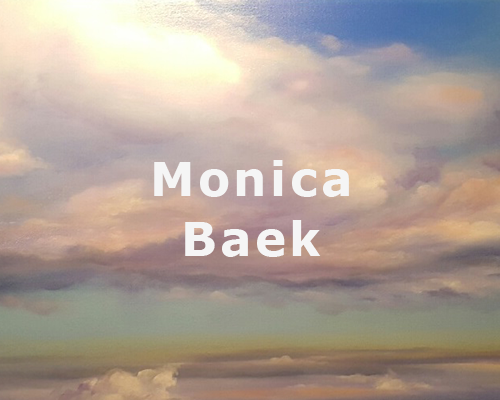 As a contemporary mixed media artist, Veronica works with various materials, watercolor, casein, oils or acrylics on a cemented or plastered canvas, to create art that is a hybrid of sculpture and painting. These 'fresco-like' surfaces may be impressed with leaves, branches, feathers, or the hands and face of the artist. The result is a fresco-like surface interlaced with fine cracks and fractures, giving it a sense of antiquity and fragility. Veronica's art has evolved out of many years experience working in Graphic Design, Fine Art and Architectural Decorative Arts and more recently, as a scenic artist in the Film Industry. This experience has inspired in her a unique creative alchemy. Veronica also specializes in the creation of site-specific paintings and art commissions. Working directly with collectors, clients and interior designers, Veronica collaborates to create unique residential and corporate art installations. Veronica’s new works and art portfolio are all available to view online. Veronica has worked in Studio 350 at 1000 Parker Street for over 25 years. 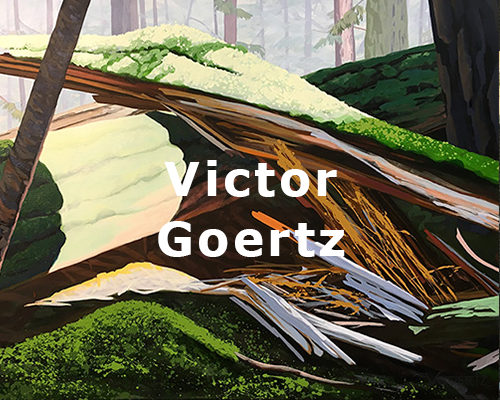 Victor was born in British Columbia and has grown up with a deep connection to our diverse and awesome natural world. All the world’s a stage, and within the wild he finds a vast theatre. He hunts for visual stories along shorelines, rivers, lakes, and deep within ancient forests looking for battles fought, lost or won with a cast of rock and tree, water and earth. He then interprets these dramatic scenes with pastels and paint and then hands it to the viewer to advance the plot. Lori Goldberg was born and currently works, lives and teaches in Vancouver. 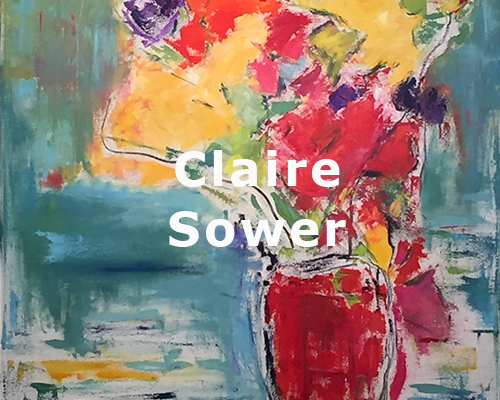 Her painting practice has evolved over the years from large, semi-abstracts through her intimate still lifes noted for their meditative qualities. 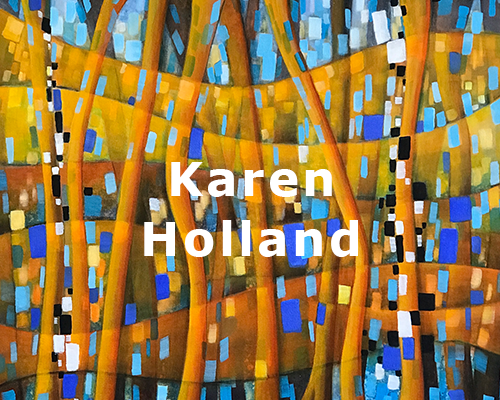 She has received critical attention for her paintings through support and awards including a Canada Council Grant and the Tony Onley Artist’s Project Scholarship. Goldberg’s work has been shown in major exhibitions at the Justine Barnike Gallery, University of Toronto, the Contemporary Art Gallery, and the KX Kunst Auf Kampfnagel Gallery, Hamburg. She has received commissions for over 100 paintings from Intrawest Resorts. 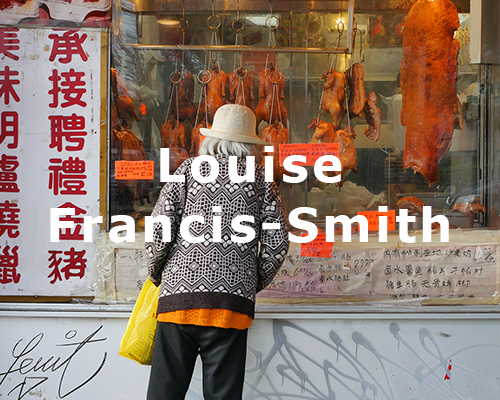 Her work is held in public and private collections including the Canada Art Bank, Contemporary Art Gallery, the City of Vancouver, VGH Foundation. She currently teaches at Emily Carr University of art and Design. Sally’s work is all about layers. Photographs layered on wood panel, followed by a combination of textures and media ranging from dry wall and fabrics to silver and gold leafing. The final layer usually involves painting with encaustic. This layering process is central to her work as it adds depth and punctuates the dream-like quality that characterises Sally’s images. Invoking a sense of mystery and isolation in a serene, contemplative sense is more a priority for her than the subject matter itself. Moody nostalgia is Sally’s ultimate goal. The inspiration for Sally’s images largely comes from her travels, which impose constant shifts in reality as she crosses borders, cultures and landscapes, both literal and figurative. By layering applications of alternating medium, color and varnish, Katherine creates shining and brilliant abstract acrylic paintings. Layers of pigments, metallic’s, and textures create complex color interactions and visual subtleties. Possessing a deep respect for our environment, her work isdesigned to reflect our natural surroundings at its most dazzling. My artistic exploration first led me the Emily Carr University of Art and Design, where I focused my studies on Figure Drawing and Anatomy as well as apprenticing as a sculptor. My post-graduate studies have included classes at the Elizabet Ney museum in Austin, TX and drawing classes with a figure drawing society at Trinity College in Dublin, Ireland, where I set up a painting studio. My wide ranging artistic interests have led me from portrait painting and sculpture, to mural work and trompe l’oeil. Concurrent to my artistic career, a strong desire to serve others led me to spend time in the Army reserves training as a medic and finally to become a career firefighter. Working in the community for the safety and well-being of others has given me a new perspective on the world and continues to provide constant inspiration for my work. Through art, I explore the human condition, the duality of lightness and darkness, personal conviction and the strength to overcome internal and external adversity. With my love for traditional materials and techniques, I strive to tell these new stories with an old language. Kelly Haydon is a Vancouver based visual artist whose primary focus is printmaking and painting, with a dash of bookmaking thrown in. Her work has been exhibited nationally, internationally and published in journals. and the mathematics of connection. 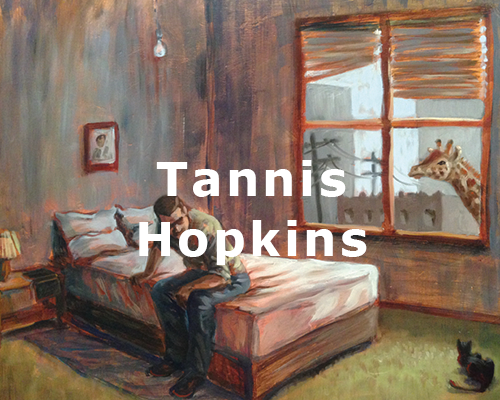 Tannis is an expressive, figurative painter who works in oil and acrylic and loves drawing as well. She studied Fine Art at college and university in Montreal and Toronto and worked as an art director/graphic designer for years. Coming from a food-centric family, cooking and exploring different world cuisines is another creative outlet for her and it is only natural then that Tannis paint food culture as well. She is also exploring depictions of familiar yet curious narratives. These works evoke a range of emotions from curiosity and a sense of the surreal, to introspection and sadness, to whimsy and a childlike sense of wonder. She likes to think these paintings create the beginnings of a story in the viewer’s mind. Through her work she hopes to find kindred spirits, and to celebrate heartfelt, sensory and meaningful parts of life. 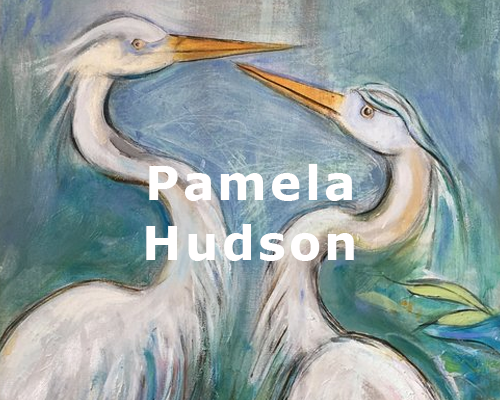 Born in Olds, Alberta, Pam studied Nursing at Foothills Hospital and Fine Art at the University of Calgary before starting her career as an ER nurse and commercial illustrator. Upon arriving in Vancouver in 1987, Pam immersed herself in the art community. Working from a studio at 1000 Parker Street with her daughter and close friend. Pam's paintings are part of an ongoing series of expressionist works inspired by life. Primary themes include the human figure, animals, still life and abstracts. Her artwork is focused on colour and line. Inspirational artists include: Sybil Andrews, W.J. Phillips, Maxwell Bates, Maude Lewis , cartoonist Jim Unger, and Vancouver artists Val Nelson and Bruce Pashak. Her work can be viewed, by appointment, at studio 328, 1000 Parker Street, "Doctor Vigari Gallery" at 1312 Commercial Drive,"32 Books and Gallery" North Van and "Paws in the City" False Creek. Pam has shown in solo and group exhibitions. Cybele Ironside is a Canadian painter living and working in Vancouver, Canada. She spent much of her youth on the islands and waterways of B.C. 's coastline and was greatly affected by the dramatic changes in light and the moods created by the climate. She works in oil, a medium that helps create the atmospheric effects of Canada's west coast. She studied abstraction in painting at the Art Students league of New York during the years of 1998 to 2003. As an artist my ultimate goal is to capture human experience - it's beauty, vitality, darkness and fragility and to progressively explore different materials and methods of rendering these portrayals of survival and hope. My art is inspired by both the stories of my childhood and stories collected as an adult. Some I know intimately, while others have been entrusted to me. Inspiration also comes by from simply wandering through my world, observing the situations, objects and people around me. My work documents pivotal moments or seemingly insignificant snapshots of the ordinary, both of which reveal profound narratives of lives both present and past. Each interpretation bears witness to an extracted memory on canvas. Cathryn was raised in an artistic household in the small mountainous town of Revelstoke, BC, surrounded by natural beauty, and artistic influences including her mother, Fran Jenkins. Cathryn’s inspiration has also come from the elements of nature. She states she does not find inspiration in city life, or conversation, but from the line and form one can find in landscape , mountain peaks, the movement of fluttering leaves, or the flight of a raptor, and more, in the day to day existence of the wild. 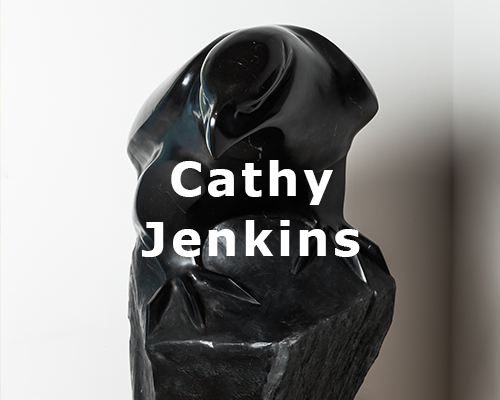 Cathryn’s sculpture can be found in important private and corporate collections worldwide, including local collections such as the Shaw Collection, Canna Construction, The Belzberg Collection, Tom and Tina Blaney, Elkay Developments, London Drugs and others. In 2015 Cathryn was commissioned to create a life size bronze Grizzly for the University of Alberta. Sarah Knoebber has held a studio in Parker since 1989. She studied glass at Pilchuck International Glass School, in early 80’s thru early 90s & was involved with Andrigetti’s Glassworks thru the 90’s. Emily Carr Art School saw a lot of her through the 90’s, as she got on to the technique of making rather huge Acrylic Transfers, which she refers to as SKINS. This is both a nod to her real job, which has been being a body centered therapist for along time (Skin as memory) and she likes the nature of their durability and lightness of being, also, acrylic is more affordable, than glass. She welcomes architectural commissions in glass or plastics. Kari Kristensen is a contemporary printmaker working in Vancouver, BC. Born in Ontario in 1972, she holds a degree in art history from the University of Guelph, where she also studied printmaking. Kari was a member of Dundarave Print Co-op prior to moving her art practice to the 1000 Parker street building four years ago. Although Kari is predominantly known for her intricate and expressive linocuts, she also employs a variety of printmaking techniques and combinations. Klee captured these images using medium format film which she prints onto transparent paper and layers over top of paint and silver leaf. The works are then sealed with a resin finish. Each piece is an original and because of Klee's process, no two will ever be the same. I graduated with a diploma in fine art from Emily Carr in 1993 and have been working full time as a painter ever since. 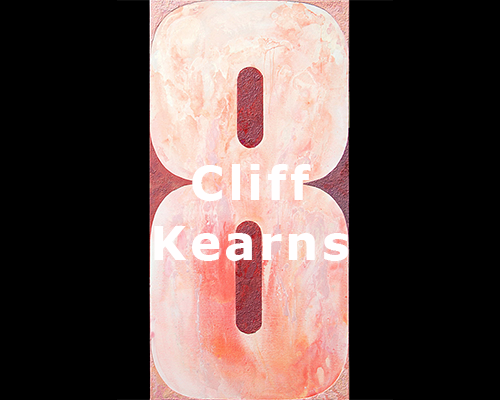 I have shown my work in a number of Canadian cities, and have had many solo shows as well as been in group shows. I am represented by the South Main gallery in Vancouver and the Vancouver art gallery sales and rental. An Israeli native, Shevy Levy began her art career in 1975, while attending university for her mathematics undergraduate degree. Her art employs a large variety of media including oil, acrylic, and pastel. Among her favorite subjects are portraits, landscapes and abstracts. 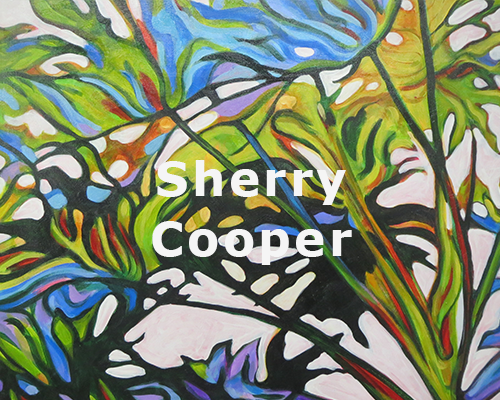 In 1993 Shevy immigrated to Canada where she very quickly associated with the Vancouver art community. She studied at Emily Carr University, and has continued to collaborate with a group of fellow artists who have inspired her steady growth. Shevy’s work has been acquired by a number of private collectors in Israel, Europe and Canada. 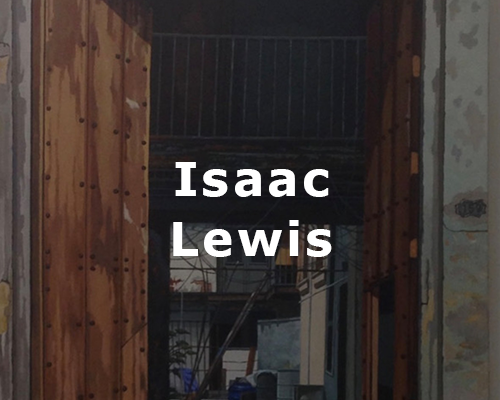 Isaac John Lewis, born in Havana Cuba, 1961, graduated from the prestigious fine arts academy in Cuba, San Alejandro in 1985 and began doing art, with exhibitions in Havana, Cuba, Minneapolis, USA, Barcelona, Spain and in the last 8 years in Ontario and BC, Canada. 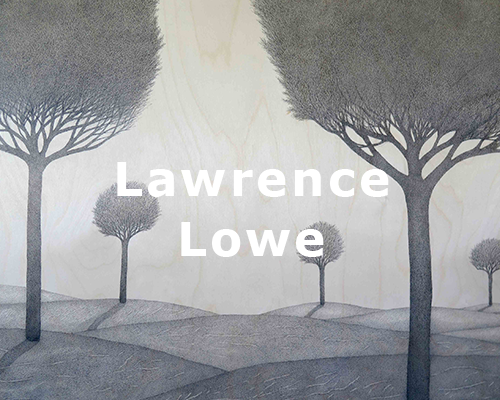 His work includes painting, drawing and hand painted ceramic. His subject is architecture and music. His art depicted old buildings, musical instruments, musicians playing jazz, jazz dancers, embracing humanized trees, and recently he started working in BC scenes, in his latest series: "Postcards from VanCuba" there are city scenes from Havana and from east side Vancouver. Isaac started doing his art at 1000 Parker street studios in 2007, and has been part of the East Side Culture Crawl ever since. In Canada Isaac has shown his art in Vancouver, Chiliwack and Kaslo in BC and in Toronto, Ontario. Sasha is an Artist, living and working in Vancouver, British Columbia, inspired by the powerful landscape generated by high granite mountains, erected by natural forces, and the constant presence of the magnificent ocean. A multitude of images, landscapes displayed as hard-edged, tough containers of immense energy, captures these forces in Sasha's paintings, as he continues to examine how we respond to the truth of Nature’s iconic status in our memories. Doris MacDougall studied Clay and Fibre as well as Fine Art at Capilano College. She works with a variety of materials often referring to the environment close to her, including our beautiful West Coast. Drawing is the core of her work. Tracy McMenemy is a mixed media artist, working to blur the line between photography and painting. Her work introduces an ongoing conversation between the two mediums, presenting their distinctions and similarities in innovative ways. At first glance, one cannot grasp what processes, materials and techniques McMenemy uses in her work. It is this uncertainty in the viewer that the artist attempts to capture with her distinct style across her various bodies of work. McMenemy is represented by South Main Gallery in Vancouver and has a variety of private and corporate collectors in Toronto, Los Angeles, New York, Belfast and Vancouver. Pilar was born in Manhattan, NYC. She grew up in La Paz, Bolivia until, at the age of twelve, her family moved to Whitehorse, Yukon. There she lived and attended junior High School. She had her first painting lessons in Haines, Alaska during a summer vacation at age 14 and from then on knew that she had found her calling. At the age of 17 she moved back to La Paz where she started attending the Academy of Art Hernando Siles and later enrolled in the Fine Arts program at Universidad Mayor de San Andres. Pilar obtained her BFA at the University of Victoria double majoring in Art History and Visual Arts. 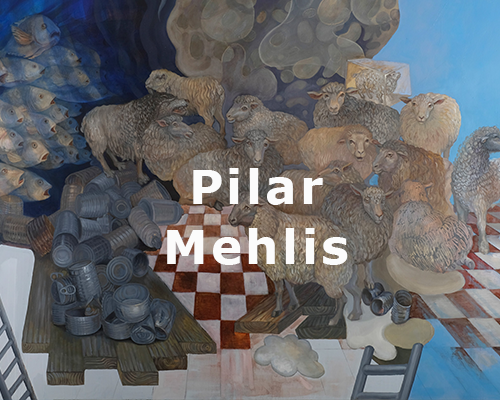 After much traveling Pilar has settled in Vancouver where she maintains her studio, shows her work and teaches drawing and painting. Marisa Mary Myrah graduated with a major in painting from Emily Carr College of Art and Design in Vancouver and completed a Post-Baccalaureate in Painting at the Cyprus College of Art in Paphos, Cyprus. 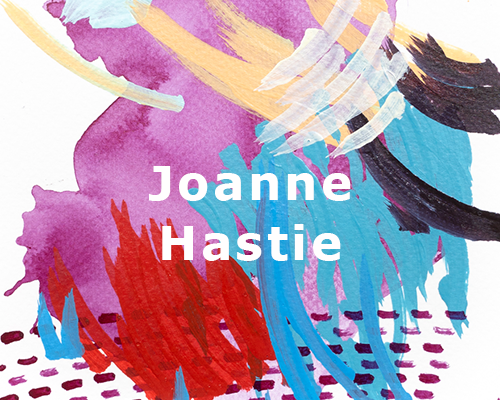 She has had a number of solo and group exhibitions in Canada and abroad and was an Artist-in-Residence at the Ucross Foundation in Wyoming, USA and at the Fundación Valparaíso in Mojácar, Spain. Parker's confident strokes form bright vivid luscious Leaves of wind blown autumn trees, gestural florals or sea blown skies and misty horizons. She is challenged by nature's physics of light, specifically refraction and reflections. The power of nature in all its dramatic beauty in these large scale canvases are intense with tension and overlays of light. 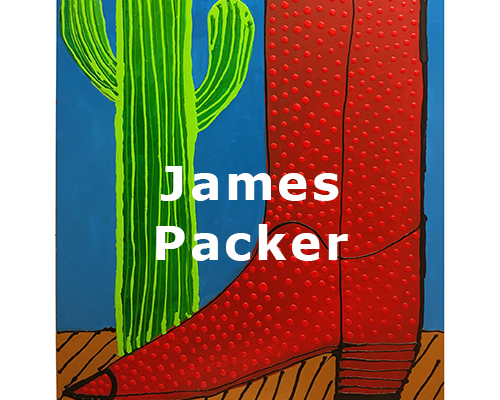 Parker shows mastery of the color palette in works all over the world including: Dubai, Basel, Switzerland, New York, Vancouver, South Africa, Bahrain. A life long artist, she is in constant pursuit of defining beauty. Barb lives and works in downtown Vancouver. Her works blend chaos and harmony, influenced by her urban life and extensive travels. 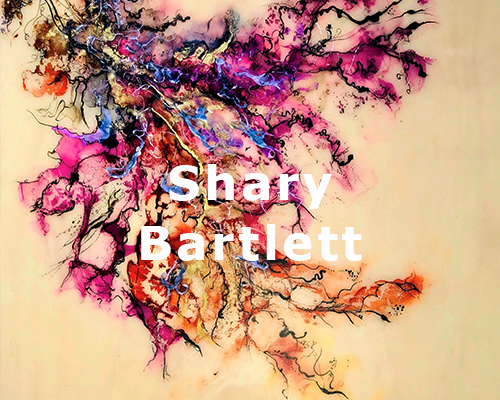 An experimental painter, Barb allows her process to direct her as to where to go with the painting, creating a very fluid process that is completely unpredictable. Particularly compelling to Barb is the richness in textures, both visual and emotional, that mixed media evokes. She uses a multitude of discarded and found materials on her paintings and creates dense layers which she then will deconstruct and rebuild multiple times, creating a surface that is multifaceted and full of meaning. Shari Pratt is a Canadian born artist who works predominantly in the medium of painting. Pratt completed her Master of Fine Arts at the Vermont College of Fine Arts and her Bachelor of Art Education Major from the University of British Columbia. Pratt has exhibited in numerous solo and group exhibitions throughout Canada and the United States. Pratt is currently interested in abstraction in relationship to topography and aerial views. 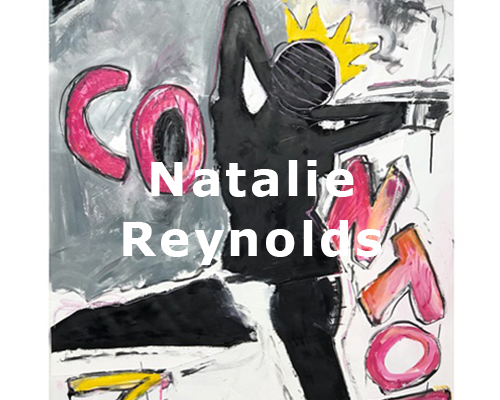 Natalie Reynolds is a Canadian abstract artist creating bold, intricate works that spark with rich colours, fragmented shapes, turbulent brushwork and restless energy freed of constraint. Born in Edmonton, Reynolds was raised in a house designed in the Brutalist style. Situated amidst a grove of deciduous trees, the home was filled with a diverse collection of contemporary art including works by Jack Shadbolt and Larry Poons. Dominating the main living area was a 16’ tall 60s-era pop art supergraphic that lingered in her memory long after. Reynolds began taking art lessons at the Art Gallery of Alberta from an early age and eventually enrolled at MacEwan University with a focus on graphic design. 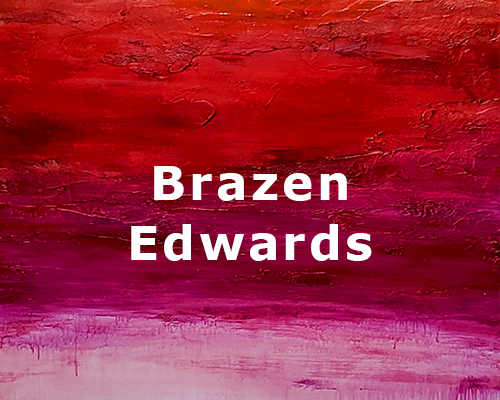 After a move to Vancouver in 1989, and years of working in the design field, she began her full-time painting career. She maintains a working studio in a converted old warehouse in the city’s eastside cultural district. 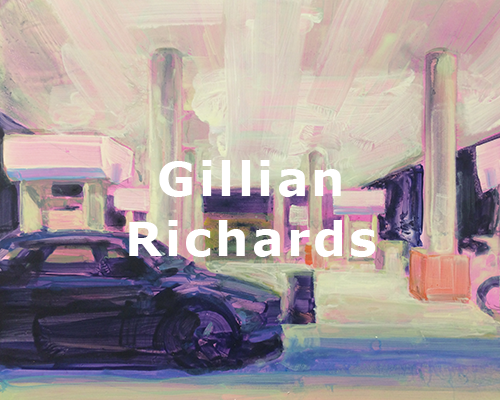 Gillian’s paintings are an exploration of the unnoticed and unremarkable spaces that are a part of her surrounding urban landscape. Subjects such as parking lots or empty backyards occupied by trailers and garages appear in her work. Drawn to the quality of light these spaces possess, and observing their ability to suggest a mood or imply a human presence, she seeks to draw from these otherwise ordinary and often stark locations a sense of intimacy and emotion. Gillian is a full time artist who has lived and worked in Vancouver for over 25 years. Along with her fine art practice and numerous painting commissions for local and international clients, she has worked in the film industry as a scenic artist. She has studied art at Okanagan College, the Banff Centre and completed a BFA at Emily Carr University in 2014. In the studio the work of the mind and that of the hand coalesce under the particular inherence of matter. One cannot trust one’s own mind to be always truthful nor the hand and eye to resist pretension, but the third element, matter, is never compromised, never without its integrity. Matter is, unlike the virtual, never without its virtue. I aspire to Chagall’s sentiment. Created almost exclusively with palette knives, my works have multiple layers and engage viewers who enjoy a shifting interaction of colour and line. As I progress in my art, I incorporate abstract disciplines such as Colour Field, Post-Painterly, and Hard Edge. The latter, for example, allows me to explore erasure and underlayers in paintings. I’m intrigued by compositions that contain various images for thought and reflection. My desire is to create a valid body of work. Jon Shaw’s work documents the urban landscape of Vancouver. Outdated alleyway structures and graffiti, trash and other objects are recreated through layers of ink drawing, acrylic puddles and bold stenciling. Jon is a full-time painter based in Vancouver, BC, with BFA from Mount Allison University. He moved to Vancouver from the maritimes in 2010 to begin his painting career. In the following 6 years Jon has exhibited at various venues in and around Vancouver including Kimoto Gallery, State of the Art in Whistler, and his work resides in several private collections including West Coast Reduction. He is an active annual participant in the East Side Culture Crawl. Press coverage includes 24 Hours, Daily Hive Vancouver and the Georgia Strait. Claire Sower is a contemporary artist based in Vancouver. She began painting professionally in 2009 following a successful career as a medical journalist. Claire’s work is bold, colourful, and whimsical. 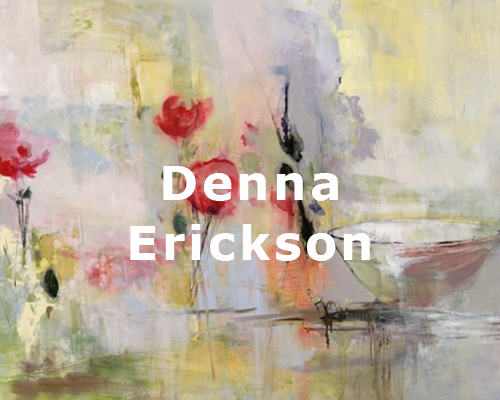 She is known for her expressionist, impasto florals and vivid landscapes. In 2014 her work appeared on the cover of a national Japanese/ Canadian arts and culture magazine and 2015 saw her first exhibit in New York. She currently has work under licence across the US and this spring was selected by Burt’s Bees of Canada to participate as a contributing artist to the company’s environmental awareness program to help save bees. Claire studied acrylic painting and mixed media techniques at Emily Carr University of Art + Design, and with various artists through the Federation of Canadian Artists and independently. She is a juried member of the Canadian Federation of Artists. I am an abstract painter living and working in Vancouver. I am particularly interested in themes of transition, struggle and growth, (both metaphorically and materially). Each painting is a visual expression of emotion and struggle, externalized through paint and materials. Some feel like storms, some like summer. My work is thematically connected by my focus on mark-making, the presence of the hand, the building of texture, and loose gestural painting. 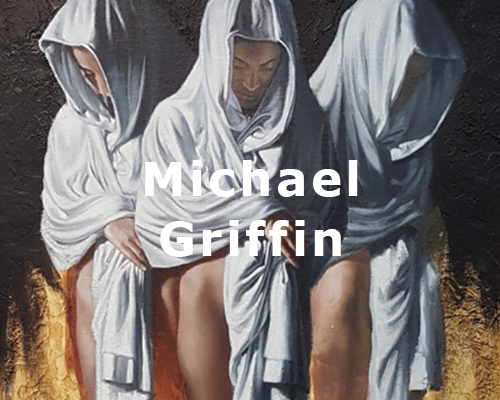 The titles of each work add another layer of meaning to the piece: I aim to make the titles equally as evocative as the painting itself, sometimes aphoristic, sometimes they are truisms, and sometimes they give warnings, and sometimes they offer a little sense of humour. 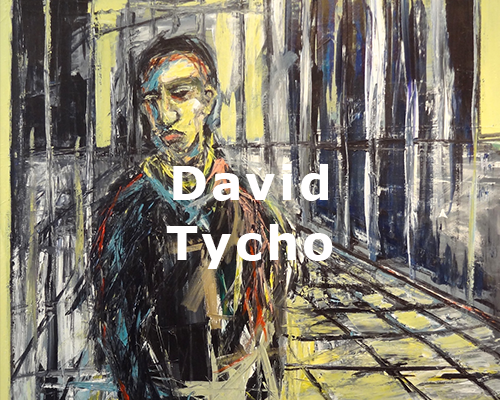 For updates on my work and upcoming shows subscribe to my occasional newsletter on my website. Commissions are available. Get in touch to arrange a studio visit! Tangible Interaction creates sensory installations that tap into some of the most basic human instincts — to play and explore. We strive to create work that generates conversation and allows people to share a magical experience. Tangible is led by founder and creative director, Alex Beim. Our team is a diverse mix of talent spanning graphic, industrial and audio design as well as programming, electronics engineering and production. Ann works in the style of Abstract Expressionism, which is a dynamic fusion of Surrealism and Abstraction, seeking to awaken in the viewer and in the artist, a deeper, often physical, response to the work. Large scale, edge-to-edge compositions and rich colours fill the eyes, often with unified fields that are connected by movement and traces of the brush. I have been creative all my life....its my passion and purpose. I create beauty. Beauty signifies hope, security, love and timelessness. My art moves from realism to impressionism or conceptualism. Whatever the "ism", if I take risks to say something new, that's where I go. I paint a visceral connection to the land and objects I am interested in. Sometimes my work is realistic, other times based on my imagination. My goal is to notice the ordinary....and make it extraordinary. I find the ordinary and paint the extraordinary. 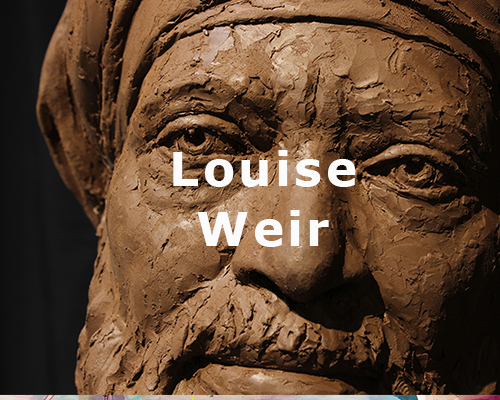 Louise is a gifted artist who works three dimensionally. She has sculpted portrait subjects ranging from judges and Popes to street people. She feels her strong background in classical ballet, vocal performance and art therapy training have contributed to her ability to express the gaze, the gesture and the essence of her sitters and to create life in her imaginary sculptures. Quebec raised, bilingual, Trinidadian-Canadian, Rose L. Williams critically investigates interstices between creative activity, trauma, transformation and aesthetics. Williams is a Canada Council Award recipient, Graduate of Emily Carr University, Certified Expressive Arts therapist, member of Kickstart - Society for Disability Arts & Culture and the Art Society of Trinidad & Tobago. Williams career in Photography, dark-room technician, Printmaker and Graphic Designer informs her current painting practice. Using her own photos as reference, Williams layers: watercolour, ink, watercolour pencils and acrylics with oil paint on panel, canvas or paper. These mixed media works exemplify Williams eclectic, multi-racial, dual citizenship background and her embrace of diverse creative modalities. Williams recent creative interests lie in exploring convergences between the personal healing journey, Biophilia, Phenomenology, Climate Change and Identity Politics through the lens of pollution, medicalization and ableism. Her work has shown in many juried exhibitions, including the 2010 Cultural Olympiad Paralympic Games. Randy started sculpting when he was a university student, with stone as the main medium. He has prospected and gathered all of the stones that he has carved, which has taken him to locations across Canada and throughout the world. Every stone is selected so that its external natural features and inner colors and patterns will complement and enhance the form. Although he enjoys creating work that is non representational, in the last few years he has focused more on works inspired by the human figure.